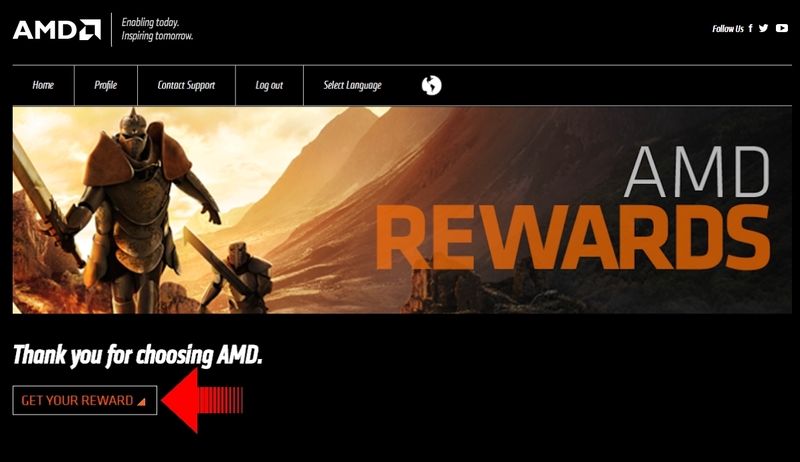 UPDATE: This Promotion has now ended, new AMD Raise the Game Promotion has begun! For those building a new Custom PC there’s a sweet promotion on at selected retailers throughout NZ and if your system includes the RX 580, VEGA, VEGA 56 or VEGA 64 Graphics Cards within you can register to redeem a Far Cry 5 game code, though this process is fairly straightforward it’s important to note you’ll have to do a part of this from the PC you’ve just built as the AMD system actually verifies hardware this time around before providing the game code. STEP #1: Visit www.amdrewards.com, sign in (it’s easy to create a new account, but remember the email address as you need it later) and the button will change, click to move on. STEP #3: System will verify automatically here. If you see the message below please ensure you have the latest drivers installed for your AMD hardware. These can be found in the AMD Driver Centre if needed. STEP #5: Once in the Uplay launcher you can activate the game code as shown below, once that’s done you’ll have the game added to your library available for download. Those fine folks at Hardware Unboxed have worked through the night and benchmarked a stunning 50 Graphics Cards using the Far Cry 5 in-game benchmark, you can check out the results in the video below! Now with more motherboard options! Promotion is valid on purchases from April 1st – June 30th (or while code stocks last) Completed registrations will still be accepted by GIGABYTE until July 15th, 2018. 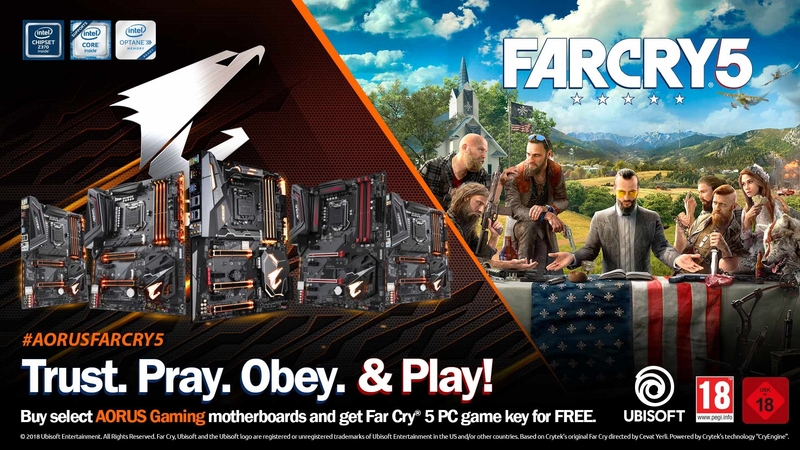 For a limited time and while stocks last, get yourself a Gigabyte Aorus Motherboard from the range below and you can register to redeem a Far Cry 5 Game Code bonus! Once you’ve got your awesome new motherboard simply follow the steps below to register and redeem your game code. STEP #1: Visit www.au.aorus.com/login and sign into your AORUS Club account, or create a new one. 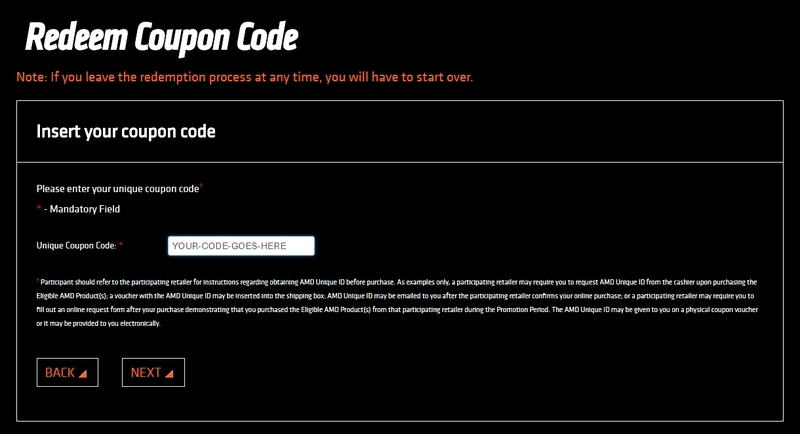 Be sure to remember the details used as you’ll receive your game code via this email. STEP #2: Visit https://au.aorus.com/game_bundle.php?Page=137# and enter the details for your product. STEP #3: Now that you have registered you’ll swiftly receive your game code from the Gigabyte team via email, once you’ve received it head to www.farcry5-redeem.ubi.com/en-US/login, login to your Uplay account (or create one) and enter your code! Now you’re in for a treat! Far Cry 5 is a multiplayer masterpiece, you take on the role of the local Sheriff for the Montana town named Hope County, and while you could just spend your time hunting and fishing (with grenades) there is an ominous doomsday cult rising up and causing some problems around town… better get onto that! With most of the game world being accessible to players after completing the game’s introductory missions, once complete you’re going to be pretty much free to rush through the world causing chaos as you see fit. An epic open-world awaits us! Brought to life by the award-winning Nemesis System, we must go behind enemy lines to forge our army, conquer fortresses and dominate Mordor from within as we prepare to confront the full power of the Dark Lord Sauron and his Ringwraiths in this epic new story of Middle-earth. 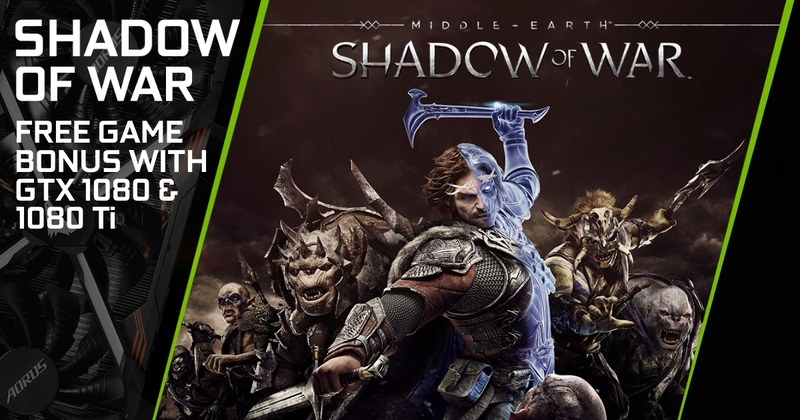 Forge a new Ring of Power, conquer fortresses in massive battles and dominate Mordor with your personal orc army in Middle-earth: Shadow of War! The fate of Mordor rests upon the choices you’ll make. So weigh them with your life, because Nothing Will be Forgotten. This awesome bonus is valid on purchases made between the 26th of September 2017 and 12th of December 2017 so get in quick! This is a register to redeem promotion so once you’ve geared up with your new hardware simple visit the website below and follow the steps along. UPDATE: GGPC Workshop spots are currently fully booked, spots may open on the days though! 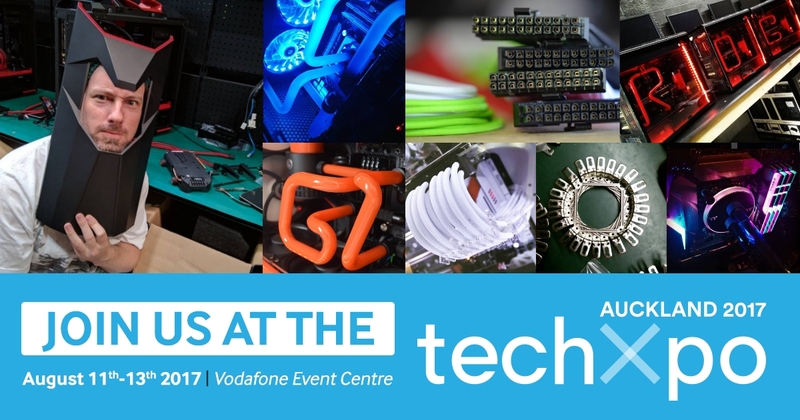 Coming up this weekend, the Vodafone Event Centre plays host to a tech fair with friends from Gigabyte, Asus, Cooler Master, G.Skill and Logitech G showcasing their latest tech devices and solutions for end users like us! They’ll be hosting demonstrations and lending expert tech advice while displaying their latest products for you to get hands on with. Brand experts will be at each booth to take you through their tech and share with you their knowledge on PC Gaming. The event centre will also host various entertainment setups such as full gaming setup areas, a drone enclosure offering drone flying sessions, workshop classes, hands-on PC builds and more! The crew from GGPC will be there hosting a workshop packed full of handy tips & tricks for water cooling, case modding, and getting the best performance for your dollar plus there will be awesome prizes up for grabs throughout each day – and a bunch of lucky attendees will get the chance to build their own dream PC at half price! 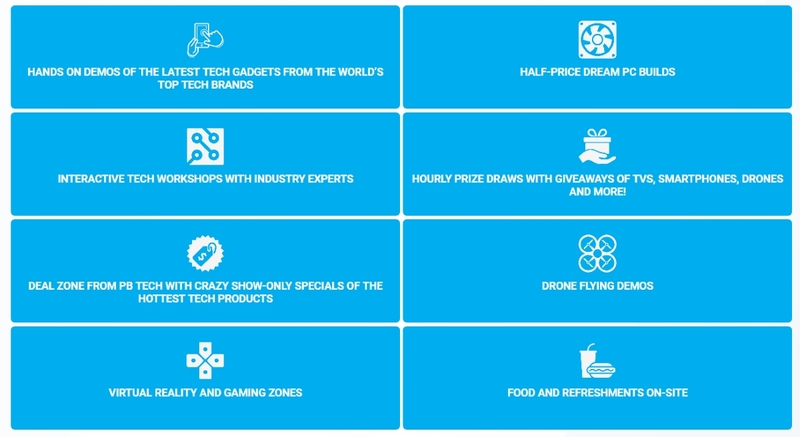 This event is free to attend so if you’re a system builder, gamer, tech guru or just interested to see the latest and greatest electronics and digital technology in New Zealand, JOIN US AT THE NZ TECHXPO 2017 THIS WEEKEND! GOOD GAMING PC – CORSAIR RGB RAM WITH GIGABYTE AORUS FUSION! 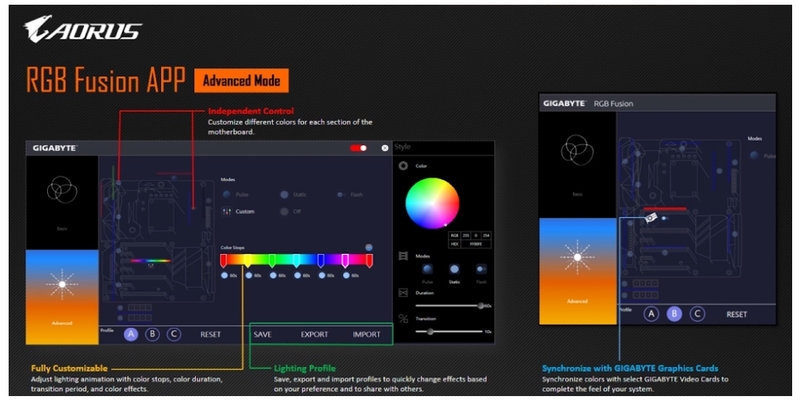 If you’re lucky enough to be packing a Gigabyte Aorus Motherboard in your Gaming PC there’s a really cool update that will let you tweak Corsairs new RGB Vengeance RAM kits within the existing Gigabyte FUSION app we already use to customise our zone lighting. 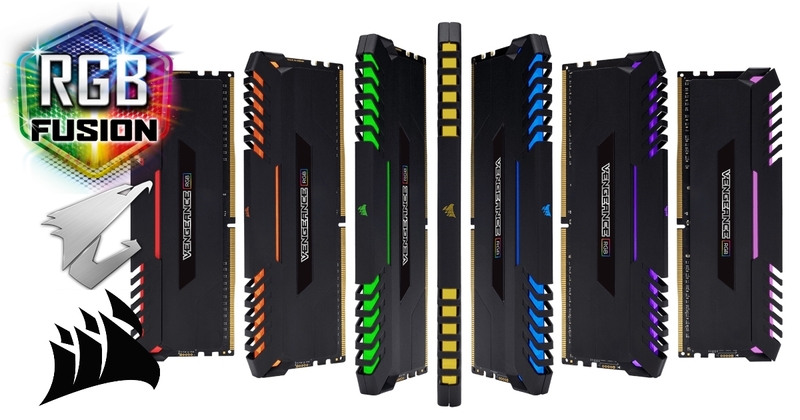 These new kits light up in one entire colour at a time rather than having individual zones, so we’re limited to showing a single colour per stick but we could still have four fitted each with their own colours, the Corsair RGB currently does four standard light effects — static, rainbow, breathing and colour shift. Fun times ahead for sure – if you just can’t wait to start playing around with this awesome new tech below are links to some of our favourite FUSION ready motherboards and also the G.Skill RGB kits which are available in New Zealand right now! 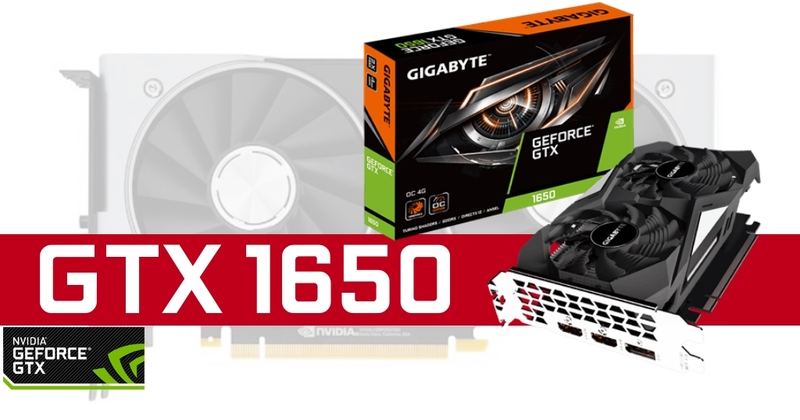 Gigabyte GA-AB350-Gaming 3 <- Ryzen ready! 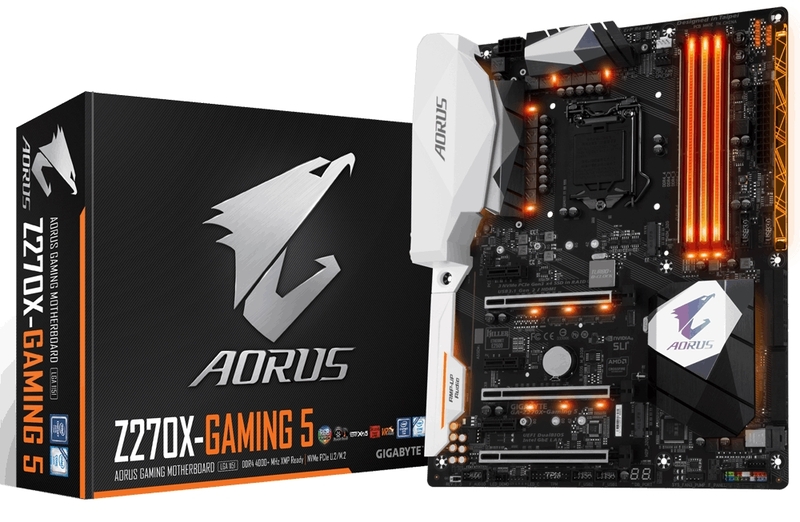 Good Gaming Motherboard – Z270 Series Unleashed! 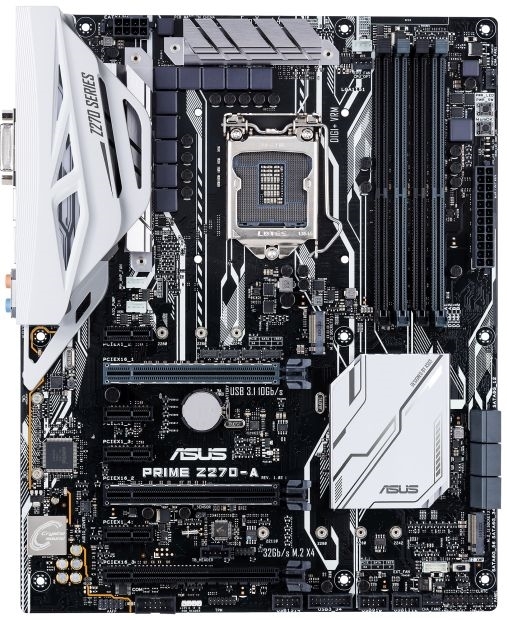 UPDATE: A full range of Z270 series motherboards is available in NZ now! One of the main reasons we like the Aorus lineup so much is because of the pure black and white colour scheme Gigabyte have gone with, and this makes using the new multi-zone RGB LED lighting system that Aorus comes equipped with all the more awesome – you can light up around the ram slots, graphics card slots and there has also been a really cool update to the trace lighting path on the side of the motherboard thanks the addition of a patterned transparent plate that really captures the LED and the glow is incredible, these plates are easily interchangeable as well so messing around with patterns for custom builds is going to be blast! 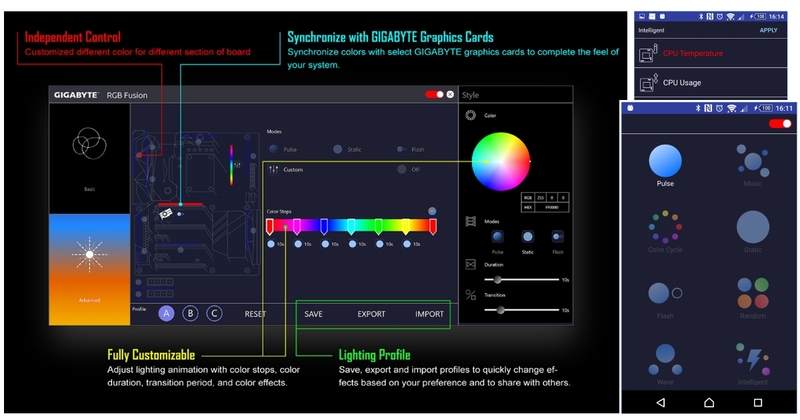 They’ve got some slick new software to make the most of this which also has the fancy name “RGB Fusion” and it will allow you to quickly customise the various zones to get the perfect look. Combine all this with some really nice features like re-enforced PCIe slots, X-Fi audio (great if you want to hear those footsteps), gold plated connections and dual M.2 slots for some very rapid storage and you’ve got one killer motherboard that looks good and can hold together a top tier system – fun times ahead! Much like the Gigabyte motherboard above this new version has had the previous blue accent removed and is now sports a clean black and white colour scheme we like. It sports those nifty fan headers as well and although it’s shy on the lighting zones (a small bit of RGB path lighting) Asus have continued to make the new lineup a little more mod friendly by offering a range of unique customisation options for those with access to a 3D Printer \o/ Dedicated mounting points on the motherboard make fitting 3D printed parts possible by using the same screws as M.2 drives (hard to find but four 2mm x 3mm screws included with the kingston ssd bracket if you get stuck) so we’ll be able fit nameplates, ninja cable covers and more as we experiment with things – With Asus backing 3D Printer modding in this way along with Cooler Master and ThermalTake we’re sure to see more and more cool models emerge for these and not just for those lucky few with a fancy new motherboard – 3D models for 120mm fan covers, 2-way SLi bridges and even cable combs!